There are few artists who write lyrics that I can identify with as an adult, and Jeffrey Lewis is one of them. 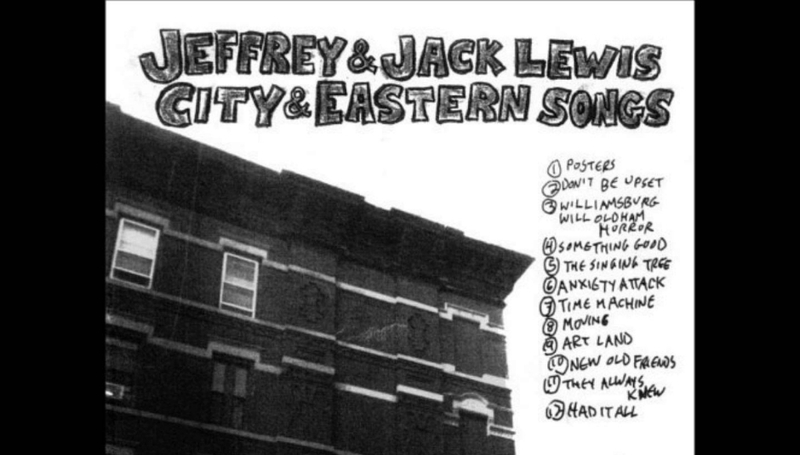 There are plenty of artists that will provide outlets for adolescent angst and romantic woes, but if what you have is anxiety about your work, your home, and your sense of purpose, then Jeffrey Lewis is your man and City And Eastern Songs (Rough Trade, 2005) is your soundtrack. Recorded and to some extent written with brother Jack Lewis (forgive me Jack, but the songs I’m most interested in here are credited to Jeff), City And Eastern Songs has the tragicomic tone of life in a large city when you’re young and ambitious but don’t yet have the resources to make things work. There’s no sense of escapism — Lewis is already in the city, already doing the work he loves, and pursuing the dream, it’s just that the reality of the dream is kind of soul destroying. The city is clearly New York, where Lewis has lived all his life, but the challenges are reminiscent of anywhere people live too closely together and compete for jobs, places to live, or seats on public transportation. Moving to the big city — or staying there once you have the option to leave, as Lewis did — is a folly of the young (I say this having lived the last 13 years in places with a population of at least one million). But where do we get this sense of urgency? Why do we bankrupt ourselves paying rents to live in these cities only to have no disposable income to participate in the things necessary to the lifestyle we wanted — i.e. the reason we chose to live in these cities in the first place? “Going home to our four roommates after paying big bucks for rockstar shows” is depressingly familiar, even if our living space is only crowded by one or two other people. The alternative scenario is ‘New Old Friends’ and the isolation of knowing that you could go out and participate but really just don’t see the point. At the center of City’s track listing and theme is ‘Art Land’, which zeros in on the ideal we’re chasing; moving to the hip neighborhood, which is probably not really hip anymore but is still a fabled cultural epicenter. The fact that the guy you passed on the street at 3am could really be a legendary figure, because there’s a studio where you passed him in this hip neighborhood. The proximity to hipness, to happenings, to be one of the people who can give that quintessentially New York refrain, “I”m so busy,” makes us stick it out even when we’re no longer convinced it's a good idea. And Lewis has plenty of moments of wondering if his city and his work are worth it at all. ‘Williamsburg Will Oldham Horror’ which recounts Lewis's doomed encounter on the subway with someone who may or may not be Will Oldham, leads him to ask, “How long should an artist struggle before it isn’t worth the hassle?” Lewis’s admission of struggling comes as a huge relief to a listener who is also struggling. No one wants to admit that their passion has left them with an empty bank account, or is funded by a day job or wealthy parents or more financially solvent romantic partners. Anxiety in general plays a notable role in much of Lewis’s catalogue, because (speaking from personal experience), some stereotypes are just true. ‘Anxiety Attack’, however, could serve as a theme song to the masses in creative fields, whether it’s music or visual art, writing or acting. There is always a panic that however much you do, there is always more you should have done, that any moment not spent creating could be wasted, and that even if you’ve been relatively successful it could fall apart at any minute. There is the constant, existential threat to keep going and make it happen now, because you may not have much time. Most of us do have time, however, to figure things out and make it work, whatever “it” is. Including Jeff Lewis. If you follow Lewis through the subsequent decade, the picture is less bleak than his version in City And Eastern Songs. In interviews and his own writing for the New York Times, he talks about the financial measures that have made it possible for him to be a full-time working artist for the last 16 years. And though moments of optimism on City are few and far between, ‘They Always Knew They’d Make It’ is a reminder that you can get recognition even after being ignored for years. I’ve seen Lewis play in dive bars in Manhattan and Brooklyn and I’ve seen him on stage at Radio City Music Hall and the South Bank Centre. I’ve watched him stand on chairs with his “low budget videos” (actually over-sized comic books he’s illustrated) and I’ve seen those images projected onto big screens for over a thousand people. It’s not a career with consistency, but it’s clearly had its high points. Maybe it’s not as glamorous as being a Rock Star, but being a working artist — or whatever your non-traditional path might be — still sounds pretty romantic.